OK so Jimmy Fallon didn't fill out the teaching artist questionnaire but I'm sure he would if I asked! He is a teaching artist by my (loose) definition! This is just pure fun. I feel I can justify putting on the blog because they are using classroom instruments, after all. 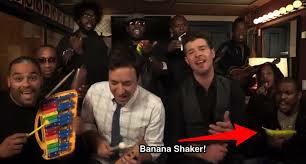 Jimmy Fallon, Robin Thicke & The Roots "Blurred Lines"
You know you love the banana shaker!